We are off to Spain for some last minute summer sun during half term and as usual a lot of thought has gone into planning what to take! The forecast is looking good at 21c most days, however I am guessing the temps will drop off a bit in the evenings and some days it looks as though it could be a bit overcast. Obviously this presents me with a bit of a dilemma but hopefully I have covered most eventualities.......if not I will have a fab excuse to hit the shops (which is what I'm planning on doing anyway whilst the hubby golfs anyway!). Starting with my travelling outfit! We have a really early start with a flight at 6.30am so I'm wearing trews, trainers and layering up with a t-shirt, sweatshirt and my Muubaa biker jacket which will no doubt be very useful for the evening chill whilst we are away! As per usual I am sticking with my mostly black uniform with a splash of grey, khaki and red just to ring the changes. I would never normally pack any jeans for a summer holiday but I figure on this trip it's best to take one pair just in case! Pull & Bear Paris sweatshirt, past season, Primark red Cola top, past season. The Jacksons London Smile bag, H&M gold clutch, ancient, Primark tote, current. My outfits from the past few days.....the Muubaa jacket is certainly earning it's keep at the moment! One last outfit today sporting my gorgeous new Donna Ida cashmere sweater courtesy of @HeroStockbridge after winning their fabulous Instagram competition to celebrate their first year of trading! As you can see....it slots perfectly into my wardrobe and could well now be coming away with me! Here are all my goodies! 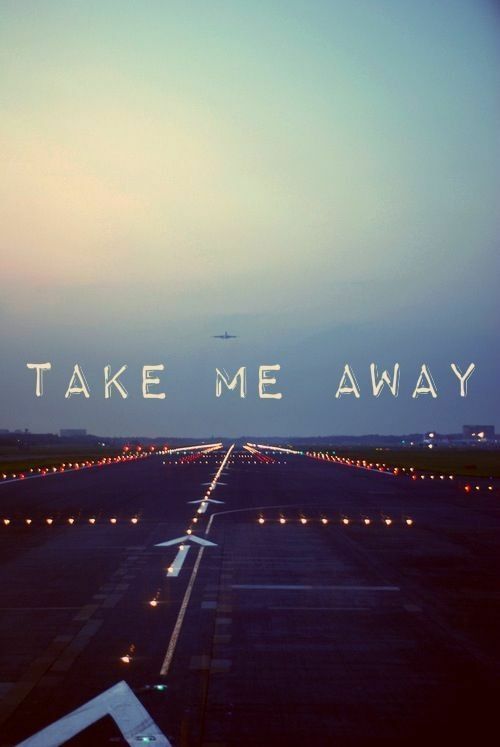 That's all from me for the next week or so, I really am in need of a break from pretty much all things web related! I will try to post my outfits of the day on Instagram...internet connection permitting. I look forward to sharing my Spanish purchases with you when I get back! 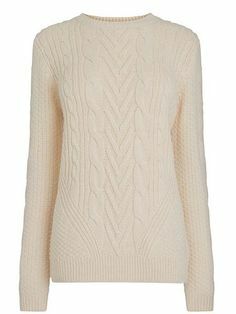 my a/w knitwear hits and picks! It's the time of year where I have a few knitwear purchases under my belt. Like buses, 3 have come along at once! We have really seen a dip in the temperatures these past few days and the forecast is not looking good for the foreseeable. I've kicked off my collection of winter wonders with a statement piece! I've been coveting this gorgeous Cos sweater for a while now (I'm holding Frances and Sue wholly responsible for this!) I thought it was high time I injected a bit of colour into my mostly monochrome A/W wardrobe so I plumped for this lovely berry shade. Stay with me while I digress a bit......got to share my bargain of the year, they just happen to look superb with the Cos sweater. I went to Clarks Village outlet centre during the week and I've had a lot of luck in the Whistles outlet shop.....who excelled themselves this trip as I picked up this fab pair of satin cropped peg trews for just a fiver! Don't you just love that kind of bargain?! These will be fab for the party season, which is now just around the corner. Back to the sweaters! 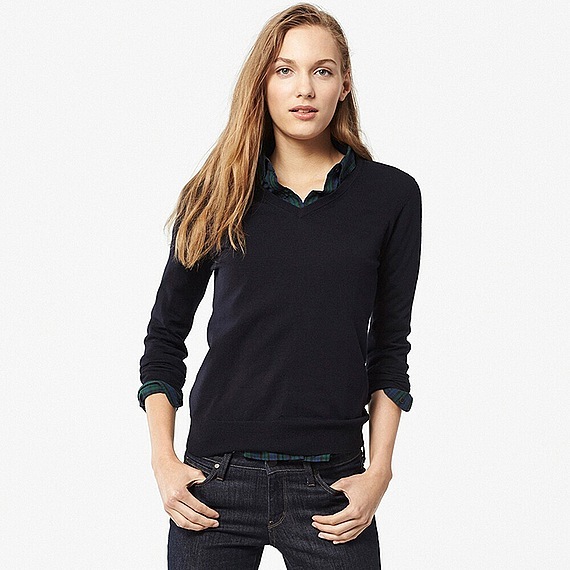 The birthday fairies didn't listen to my plea for some Uniqlo cashmere but I still had a gap in the wardrobe for a navy v neck jumper so I decided to go for some more of their trusty merino, which I have to say I feel will be far more easy to care for as they easily go in the machine! 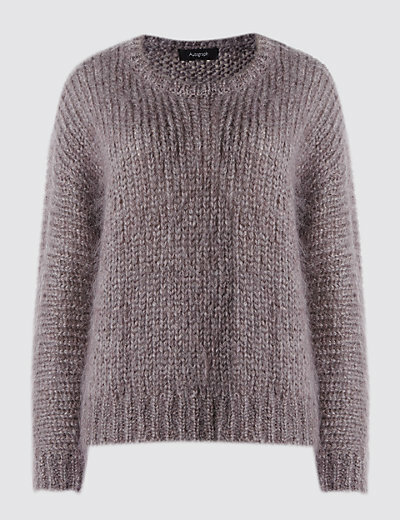 Sticking with basic knitwear shapes, I bought this oversize dark marl grey H&M pullover as it will basically go with everything in my wardrobe and I love the shape! As you can see there are many outfits crying out for this style! A close up of the sweater.....view from the top! What else is on my radar knitwear wise? 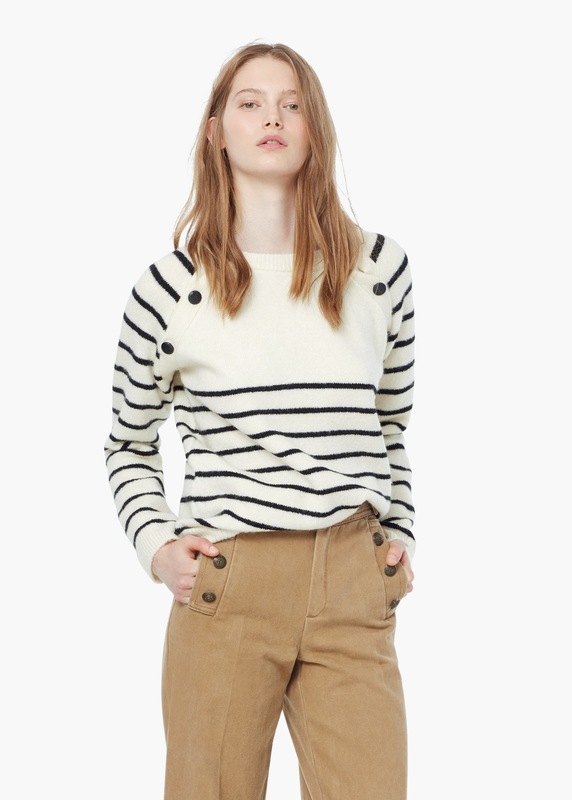 Well I'm still cogitating about the Topshop Breton from my last post here. There is something similar from Mango which I'm going to look at first before I decide whether or not to purchase (thanks to Sue @highstreetedited for alerting me to the fact that the reviews weren't too good on the Topshop one). 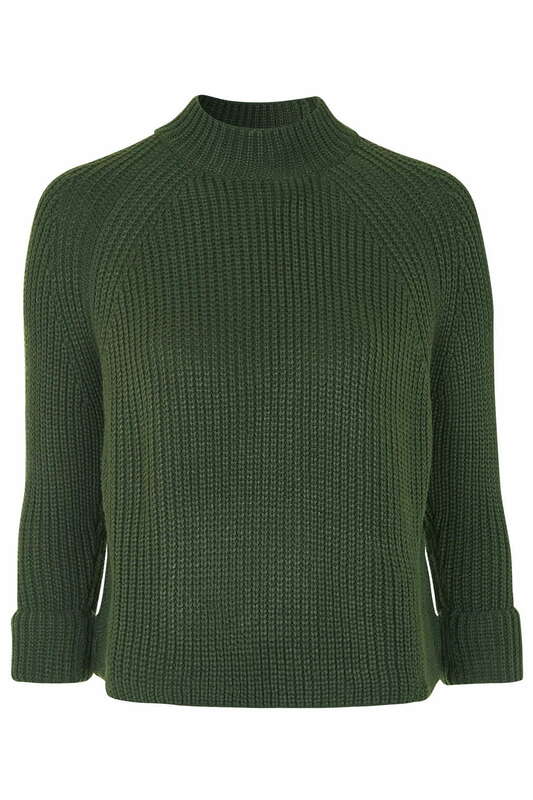 Another Topshop jumper that I love is this little khaki number. I think this would look ace with black skinnies and tan Brogues a la Audrey Hepburn?! 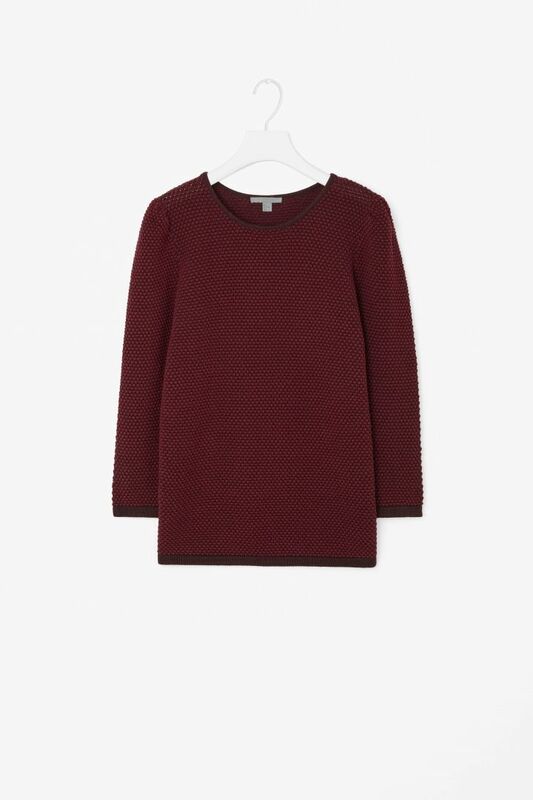 I also love this from Topshop, though it's not technically a sweater, more of fleecy sweatshirt. This would be fab for lounging around in on a cold and dreary Sunday! My finger has been hovering to click away on this one for the past couple of weeks! 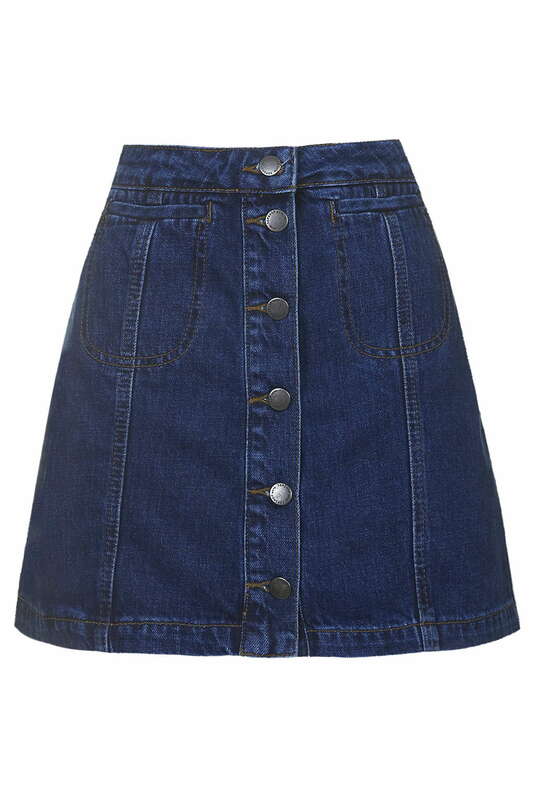 This would be ace for layering over my Missguided maxi dress! 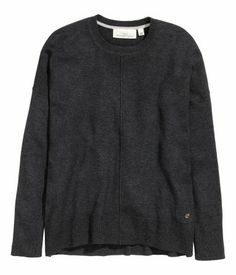 If I didn't already have a grey Zara sweater similar to this M&S one, it would be coming home with me! And last but not least....the nearest you'll ever see me in anything resembling a Christmas jumper! 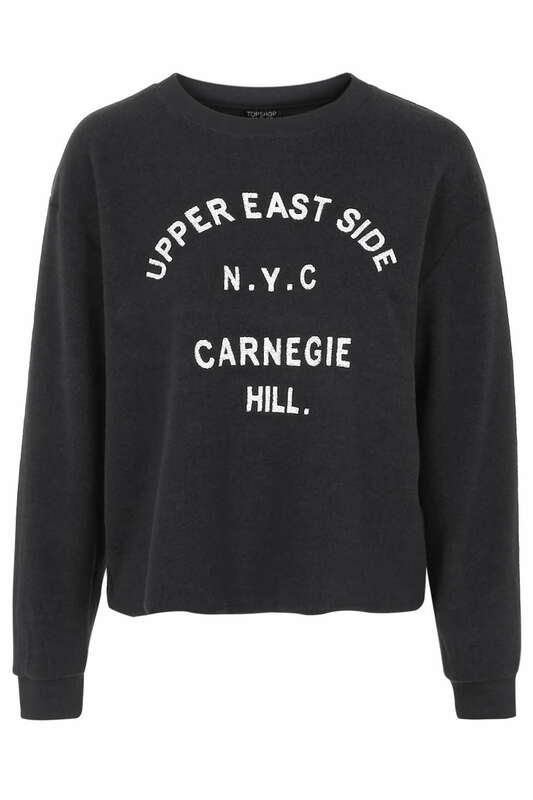 Have you been stocking up on sweaters? Anything brands on the High Street excelling in knitwear department? What styles have caught your eye? A quick outfit round-up as always! a simple yet chic celebrity style steal! When I spotted this picture of Diane Kruger, I literally did a double take as whilst perusing the rails in Topshop yesterday as I spotted some excellent replicas to make up this chic outfit! You can shop this whole look in good old Toppers for a fraction of the cost of the Isabel Marant sweater Diane is wearing! This beauty is now top of my wish list! 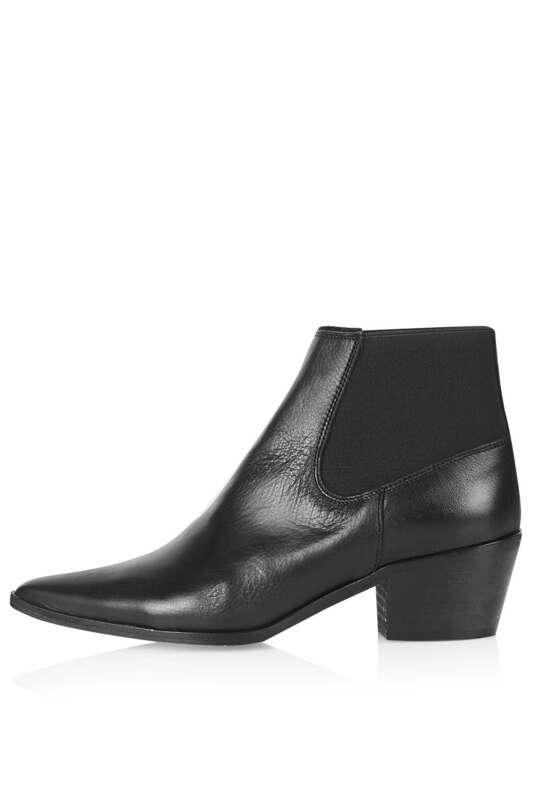 How gorgeous are these boots too?! These would be fab for a rainy day school run! Simple but perfect! I think I could shop my own wardrobe for similar pieces though I admit defeat, I reckon it's time to get the tights out since the bare-leg weather seems to have left us for good.....but!! In a couple of weeks I can see me sporting this ensemble with a pea coat and opaques....very parisienne non?! Much more wearable for the school run as well! It really is a short and sweet one from me today....only an outfit or 2 to share from the past couple of days! Primark jacket, past season similar here H&M sweater, current here H&M jeans, past season similar here Converse, here Lulu Guinness bag via eBay A view from the top of this outfit so you can see the texture of the H&M sweater.....I love it! 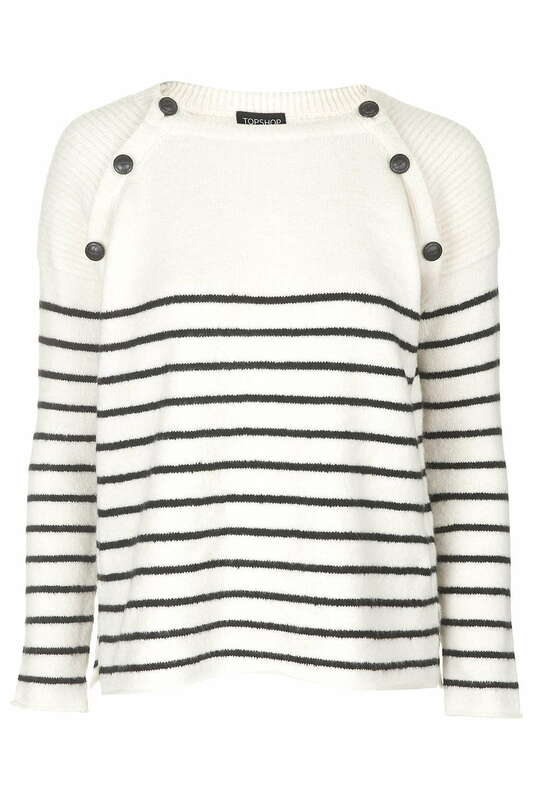 There is always room in the wardrobe for another Breton.....am I tempting you with this one? 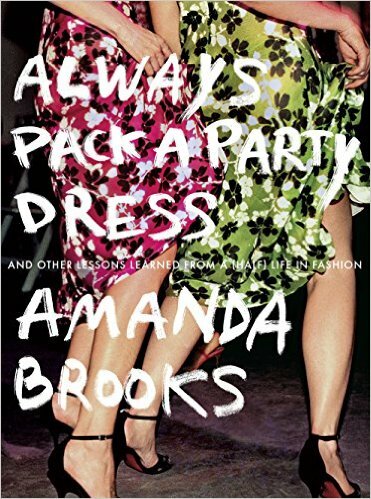 and another fab style icon who is new to me is Amanda Brooks author of Always Pack a Party Dress. I received this fantastic book for my birthday from my fabulous friend Claire (who is very stylish and creative herself, see here!) and I have been devouring it's content ever since! It's part autobiography as Amanda has enjoyed an amazing career in fashion but every few pages she shares some amazing styling tips! For those of you who may have enjoyed a bit of Konmari-ing lately, I think this another book that will really appeal to you! Amanda has a wealth of knowledge from her brilliant career in New York working in various capacities with top designers and stores but has now moved to the UK and swapped her glamorous occupation for a more simple life in the English countryside. She had to decide what clothing from her extensive wardrobe would survive a gigantic cull and work for her new lifestyle. It makes for fascinating reading and she imparts some brilliant advice! It really is a great insight into fashion by someone with a wealth of experience as she talks about what has influenced her style and she even shares some great advice for anyone looking to secure a job in fashion....it has left me truly inspired! This would make a fantastic gift for Christmas for those of you who want to give your friends a real treat! Or better still pop it on your Santa's wish list as I have popped her first book I Love Your Style on mine! Rolex, my most treasured possession as it belonged to my dad. So, I'd love to hear if would you find it easy or hard to whittle down your favourite pieces. What are your wardrobe classics that come out year after year? I am all ears! Maybe there is a gem or two I've forgotten?! What I've been sporting these past few days. Have you read any other inspiring fashion books? I would love to hear if you have come across any other interesting reads!